Hopefully you have seen or heard about ChefsGiving Week, a huge restaurant-driven fundraiser (running November 13th-19th) for Northern California fire relief! It’s a massive effort from San Francisco Bay Area partners to help those in need of temporary and long-term housing throughout Wine Country, with more than 100 restaurants offering special ChefsGiving menus, proceeds from a specific menu item, or hosting a fundraising event or proceeds of sales to support Tipping Point Emergency Relief Fund and Restaurants Care. There are also pop-ups powered by Feastly, before and during ChefsGiving week, for chefs without a permanent restaurant space. Take a look at and follow @chefsgiving on Instagram for updates on all the partners and what they are offering. 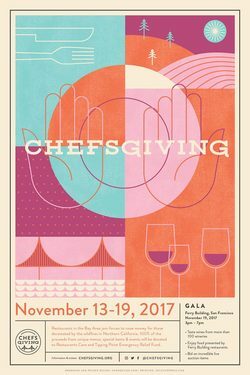 The week culminates in the ChefsGiving Gala on Sunday November 19th (4pm-7pm) at San Francisco’s iconic Ferry Building. The event will showcase 250 wines from more than 50 wineries, with food provided by restaurants located in the Ferry Building Marketplace. Cocktails and bites will be served outside in the CUESA kitchen, Hog Island will provide oysters, and guests can enjoy a cheese and foie gras cave featuring cheese from Cowgirl Creamery and members of the California Artisan Cheese Guild. An inaugural Chef Humanitarian of the Year Award presented by Williams-Sonoma will also be given to a local chef. And a live auction (hosted by Liam Mayclem and Leslie Sbrocco) will help raise even more funds. Two ticketing options are available: $195 VIP tickets (arrive an hour before general admission at 3pm to mingle with ChefsGiving Week restaurant chefs, enjoy exclusive Champagne tastings and caviar from The Caviar Company) or $125 general admission (4pm). Huge thanks to Foodie Chap Liam Mayclem for starting this effort, and all the media, marketing, PR, and hospitality folks helping to make this a success! Here’s to hopefully exceeding your $1 million goal!